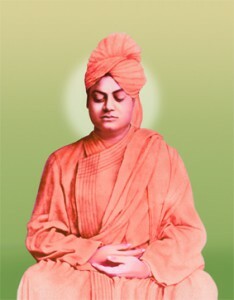 Swami Vivekananda, known in his pre-monastic life as Datta, was born in an affluent family in Kolkata on 12 January 1863. His father, Vishwanath Datta, was a successful attorney with interests in a wide range of subjects, and his mother, Bhuvaneshwari Devi, was endowed with deep devotion, strong character and other qualities. A precocious boy, Narendra excelled in music, gymnastics and studies. By the time he graduated from Calcutta University, he had acquired a vast knowledge of different subjects, especially Western philosophy and history. Born with a yogic temperament, he used to practice meditation even from his boyhood, and was associated with Brahmo Movement for some time. After the Master’s passing, fifteen of his young disciples (one more joined them later) began to live together in a dilapidated building at Baranagar in North Kolkata. Under the leadership of Narendra, they formed a new monastic brotherhood, and in 1887 they took the formal vows of sannyasa, thereby assuming new names. Narendra now became Swami Vivekananda (although this name was actually assumed much later.